The Schaller Signum bridge is a gorgeous wrap around tailpiece with individually intonatable saddles and locking bridge posts. 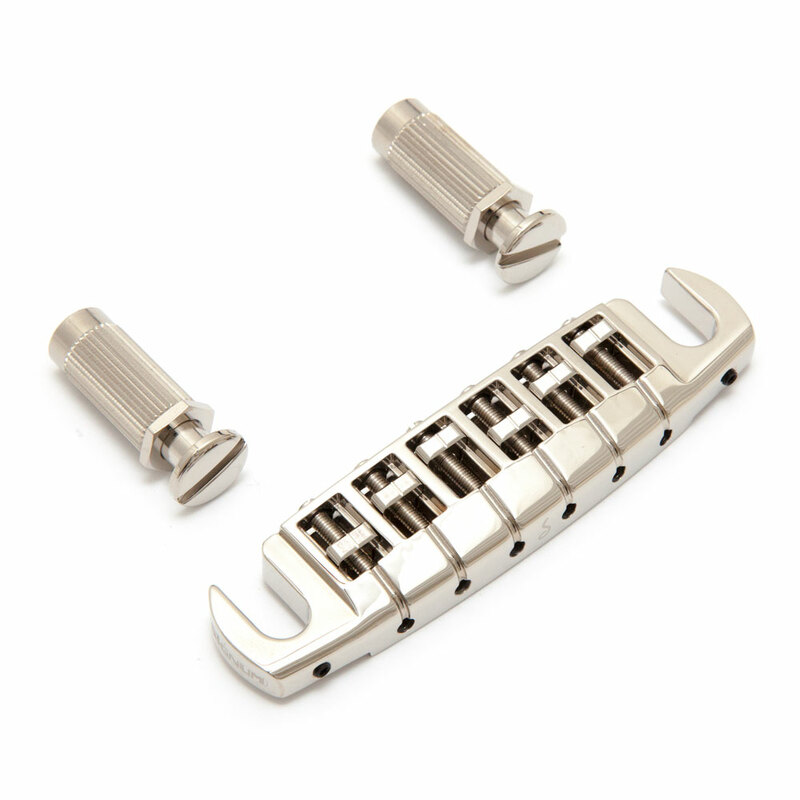 To use the locking posts simply adjust the bridge height as normal then use the included tool to tighten the locking nut from below against the bridge, this keeps the bridge level and ensures maximum sound transmission to the guitar body. The saddles are machined brass and shaped to provide the best string break angle over the bridge, in addition to individually intonatable saddles the Signum bridge has allen/hex screws behind the bridge posts that can be adjusted to move the whole bridge backwards and forwards and also slant it to add more intonation room to heavy bass strings, there are two sets of allen/hex screws included (6 mm and 10 mm long) to ensure the perfect bridge placement. The strings thread through the bridge from the front and the ball end retainers in the bridge are rectangular shaped so that the ball end cannot rotate in the bridge and untwist the end of the string. 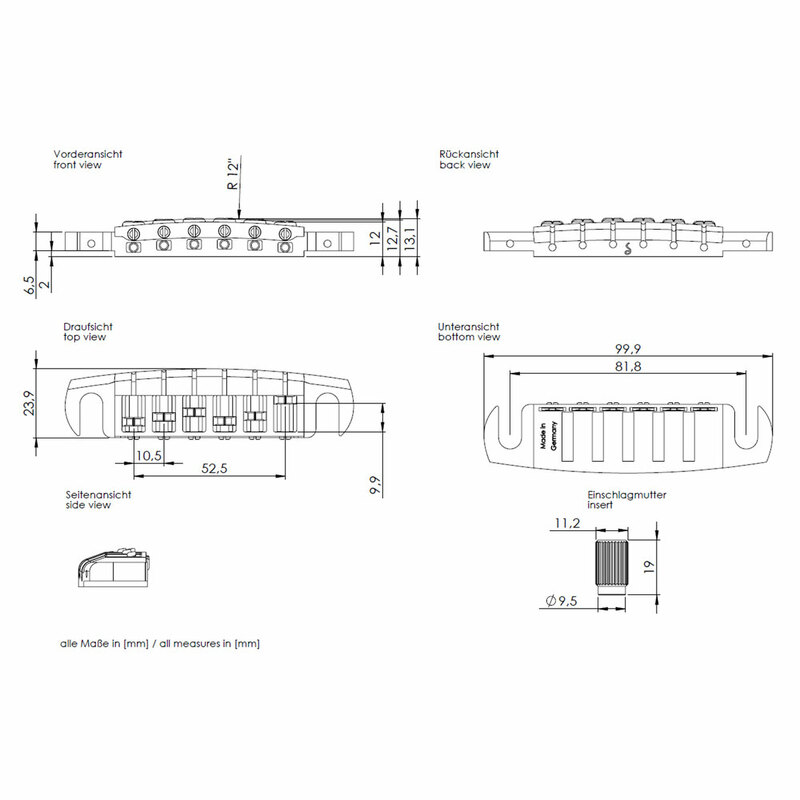 The bridge is supplied with metric 8 mm threaded locking posts and body anchors/bushings as well as a set of imperial 5/16-24 threaded (Gibson spec) locking posts for installing on guitars with imperial body anchors/bushings pre-installed (imperial bushings not provided).